The latest release of Ubuntu 10.04, code-named Lucid Lynx, has a somewhat revamped user interface. One of the most significant changes is the Software Center, which provides a simple, user-friendly way to find and install your choice of thousands of free, open source apps. While there are many ways to install apps in Ubuntu 10.04, the easiest way is to click Applications from the top-left panel and select Ubuntu Software Center. 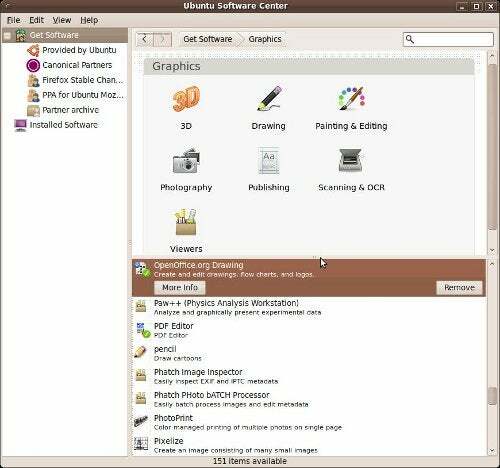 The Ubuntu Software Center organizes apps into 13 Departments: Accessories, Education, Fonts, Games, Graphics, Internet, Office, Science & Engineering, Sound & Video, Themes & Tweaks, Universal Access, Developer Tools and System. Let's click on Graphics, for example. The top pane shows more sub-categories; the bottom pane is a scrollable, alphabetized list of all apps in the Graphics Department. If you need more room, you can resize the panes by dragging the borders. Let's check out Painting & Editing. 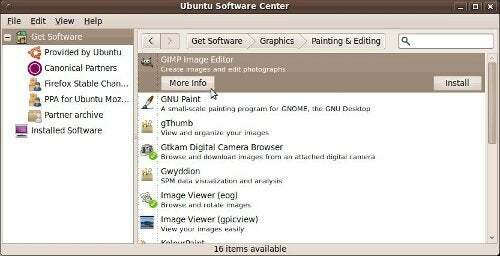 By default, Ubuntu 10.04 no longer includes the open source Photoshop-replacement known as the GIMP. Click the More Info button to learn more about the GIMP. (Notice the Website link. Links like these will take you to Web pages where you can find even more documentation about the app.) 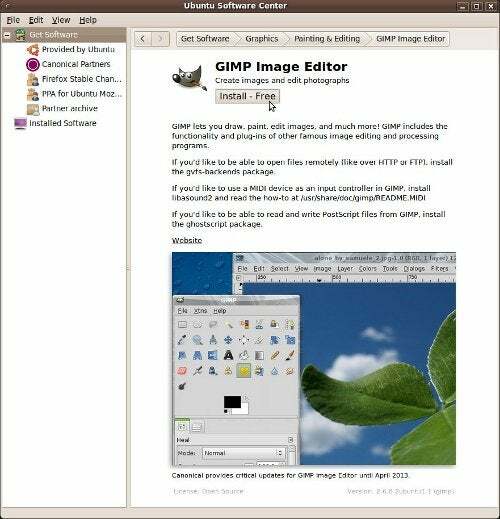 If you want to do any substantial image editing in Ubuntu, you will need the GIMP. Let's install the GIMP by clicking the Install-Free button. 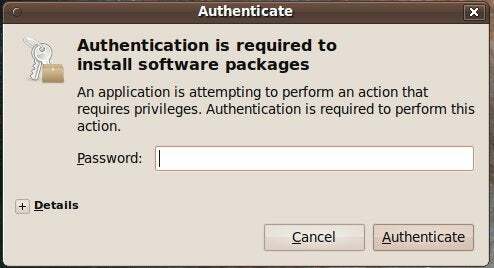 To install an app requires root, or administrative access. Usually that is the same password you use to log into your computer, but that may vary depending on the options you chose when you first set up your system. Enter your administrative password and click Authenticate. The GIMP is a large download, so depending on your Internet connection speed, installation may take a few minutes. When it's installed you will see a green checkmark next to a button that says Remove. Not surprisingly, the Remove button will un-install the app if you click it. Ubuntu 10.04 is an easy-to-use Linux operating system that "just works."